T-type Ca2+ channels are widely expressed throughout the urinary and male genital tracts, generally alongside L-type Ca2+ channels. The use of pharmacological blockers of these channels has suggested functional roles in all regions, with the possible exception of the ureter. Their functional expression is apparent not just in smooth muscle cells but also in interstitial cells that lie in close proximity to muscle, nerve and epithelial components of these tissues. Thus, T-type Ca2+ channels can contribute directly to modulation of muscle function and indirectly to changes of epithelial and nerve function. 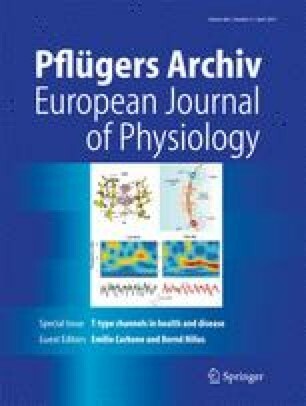 T-type Ca2+ channel activity modulates phasic contractile activity, especially in conjunction with Ca2+-activated K+ channels, and also to agonist-dependent responses in different tissues. Upregulation of channel density occurs in pathological conditions associated with enhanced contractile responses, e.g. overactive bladder, but it is unclear if this is causal or a response to the pathological state. Moreover, T-type Ca2+ channels may have a role in the development of prostate tumours regulating the secretion of mitogens from neuroendocrine cells. Although a number of selective channel blockers exist, their relative selectivity over L-type Ca2+ channels is often low and makes evaluation of T-type Ca2+ channel function in the whole organism difficult.